Cucina Kitchens and Baths of 4420 Broad Street Suite F1, San Luis Obispo, California has been awarded “Best Of Houzz” for Customer Satisfaction by Houzz, the leading platform for home remodeling and design. 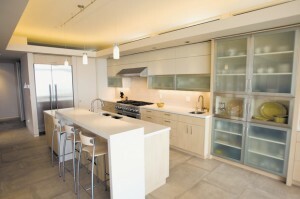 The locally owned design and custom cabinet manufacturing company was chosen by the more than 25 million monthly unique users that comprise the Houzz community from among more than 500,000 active home building, remodeling and design industry professionals. The San Luis Obispo Tribune recently featured a new local home on the Cayucos shoreline that included custom cabinets and interior design help of Cucina Kitchens and Baths. 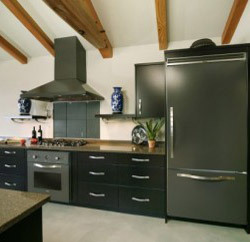 Photo of kitchen designed and built by Cucina, as pictured in SLO Tribune. Each morning, Carol and Glenn Oelker wake to the sight of gulls circling the surf and otters foraging for breakfast. This was not always the case. Carol, a retired school counselor for the San Luis Coastal Unified School District, and Glenn, an ophthalmologist, lived in an Avila Valley home for 19 years. This June, they downsized from that 3,800-square-foot residence to a more modest 2,600-square-foot beachfront house in Cayucos. When it comes time to consider a new kitchen design and remodel, it is important to keep in mind that the kitchen is the heart of the home for most homeowners. Whether redesigning a kitchen to accommodate a growing family or replacing existing cabinetry for a more updated look, turn to the professionals at Cucina Kitchens and Baths – your kitchen remodel experts. From complete space planning to functional layout and design, owner Cindy Collins and her assistant, Lisa McNamara, have the knowledge and experience to meet each of their clients’ individual needs.